The heart of the starting and charging system, in your car or light truck, is your battery. Today's electronic laden vehicles require electrical power not only to start your vehicle but then to run all of the critical computer systems and convenience devises. With the introduction of computer systems into nearly every function of the vehicle, the required load is often on the ragged edge of what the battery can provide. That is why it is important to maintain your battery to prevent premature failure and breakdowns. Vibration- Severe vibration or impact can dislodge the lead paste, in the battery cells, drastically lowering the available power output. AGM batteries like the Optima brand are less susceptible to this failure than standard flooded cell lead acid batteries, but even they can be damaged by severe conditions. The easiest way to limit vibrations to you're battery is to make sure they are properly installed and secured. Loss of Electrolyte- Over time heat from the engine, and even hot summer conditions, will cause the water in your battery to evaporate. The constant charging and discharging that your battery sees during normal use also contributes to electrolyte loss. Low electrolyte conditions will cause excessive gassing, excessive battery heat and shorting of the plates inside the battery. The easiest way to prevent premature failure due to electrolyte loss is proper maintenance of the battery twice yearly. Corroded Terminals- When the battery charges and discharges during normal operation, acid is suspended in the gasses that are vented. This acid builds up on the surface of the battery terminals first as a damp residue them over time as acid salts. Corrosion from the build up can get between the terminal and the battery post causing high resistance and ultimately a bad connection. Regularly cleaning the terminals and posts prevents these types of failures. 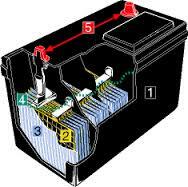 Age- The service life of your battery is in large part effected by heat and lack of maintenance. Here in Texas the average life of a standard battery is around 3 years. Proper installation and regular maintenance will go a long way towards preventing premature battery failures. So stop by Kool Kar Auto Repair today for all of your starting and charging system maintenance and repair needs. I am so sorry I am just answering your comment but for some reason it did not come through properly. However I do appreciate your nice words. Thank you brittanymlemay for reading my blog.